Matson Keller knew exactly what he was going to do with his piggy bank that contained loose change from around the house and his allowance. It wasn’t until the right opportunity arose, when he went through with it. It all began at the Dacotah Bank drive-through, where Matson and his siblings, Claire and Carson, saw a donation box for backpacks. 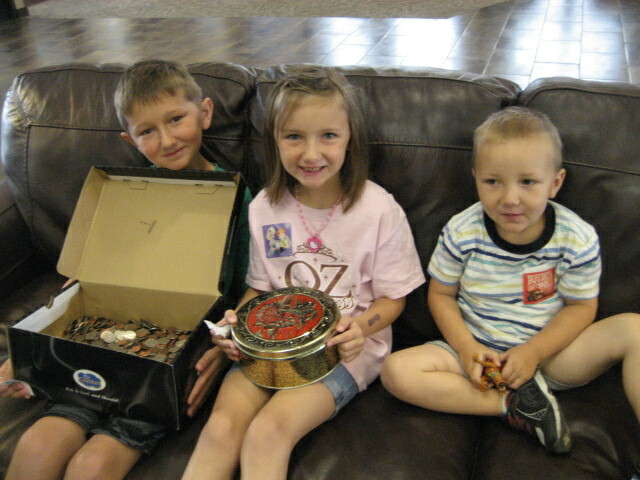 The trio of kids begged their mother, Kylie Keller, to bring their change so they could donate to it. The next time they went to Dacotah Bank, the box was down. After a while, a different opportunity arose for the Keller children to make a difference for someone they knew. Kylie grew up in Trail City with the Keller’s and attends the same church as they do, Saint Joseph Catholic Church. The three Keller kids, Matson, Claire and Carson, decided that they would donate their piggy banks to the Dacotah Bank fund set up for Abby. Matson, the ringleader, and his younger siblings worked feverishly around the house to find much needed change. Kylie and her family had a bit of a medical situation on their own hands this past year, as Claire was at Mayo Clinic in Rochester, Minnesota. All in all, the children managed to scrape together around $275 for their donation to the Abby Keller Fund and were extremely pleased with their efforts. “Between the three of them, they have been saving for six to eight years,” Kylie said. “They had half of a shoebox and they were really excited about that. It doesn’t stop there for Matson Keller, who is still searching for different ways to help people who are in need. The benefit for Abby Keller will be at the Moose Lodge on Saturday, July 28. Both a live and a silent auction will take place at the event. Baked goods, gift certificates, massages, wall décor and fishing trips are some of the items up for auction. Spaghetti and salad will be served. An account has been set up with Dacotah Bank, which will help with the treatment expenses put on the family.